El Café de la luz is a small yet cozy coffee shop located right in heart of Madrid in the trendy Malasaña neighborhood. If you want to start your day with an authentic Spanish breakfast then this is your spot. The café offers casual and comfortable seating with couches, pillows and arm chairs that make for an inviting and warm atmosphere. 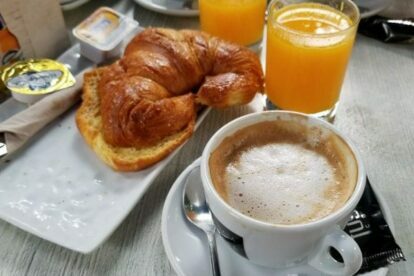 The menu offers breakfast combinations as low as 2.90€ which includes a coffee, tea or colacao (Spanish chocolate milk) with a croissant or bread and jam. You can also add tomato, ham, cheese, nutella, among other toppings for a little more. This café is a great starting point for any day in Madrid. After a nice, light and typical breakfast, you will feel ready to tackle other great spots throughout your day in Madrid. If you are feeling a little more hungry, the café also offers a brunch menu with items such as sandwiches, assorted meat and cheese boards and cakes. In addition to this, the café offers beer, wine and their own set of cocktails (it’s vacation, why not?). The café has great service with a friendly staff. Sit back with your coffee, relax, people watch a little and get ready to explore this amazing city.